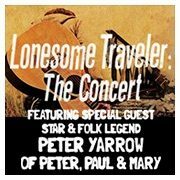 This concert version of the acclaimed Off-Broadway musical tells the story of Americana music from Woody Guthrie to Bob Dylan and beyond—including the music of Pete Seeger; The Kingston Trio; Peter, Paul & Mary; Joni Mitchell; The Byrds; Joan Baez; Crosby, Stills & Nash and more, plus a special tribute to Leonard Cohen. An inspiring evening of great music that includes charismatic singers and multiinstrumentalists, multimedia projections, and lots of fun sing-a-longs, this concert is perfect entertainment for audiences of all ages. Tickets are available now to groups of 10+ and can be added to a Zhang Financial Broadway in West Michigan Series Subscription by calling (269) 387-2300. Single ticket on sale date to be announced.